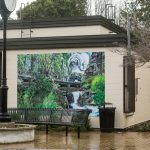 Mark your calendars folks, Chemainus Festival of Murals Society’s annual general meeting is on Thursday, April 19, at 7 p.m. The gathering will be held at the Best Western Chemainus. You must renew, or get a new membership, at least 30 days prior to the AGM to be eligible to vote. – “Steam Train On Bridge Over Chemainus River”, lost when the building was demolished, rose again on the Telus Building (using an innovative technique). The Society’s 2017 successes were made possible through our memberships and many generous donations. Thank you to those of you who are members of the Chemainus Festival of Murals Society. Your support is a critical link to the success of our organization. A continuing strong membership will strengthen our ability to implement vital new concepts and will assist in securing future funding. Please renew your membership as soon as possible by completing the attached form, and mailing it and your cheque, payable to The Chemainus Festival of Murals Society, to Box 131, Chemainus, BC, V0R 1K0. You can also pay online at our website www.muraltown.com (please refer to the renewal invoice for assistance). We look forward to 2018 as we continue to promote the worldwide image created by “The Little Town That Did”™ … and keeps on doing.